I couldn’t help thinking of Greek mythology today and poor old Sisyphus. First, let’s start with the poor sod’s name. Sisyphus. If that hurdle wasn’t enough, the gods condemned Sisyphus to ceaselessly roll a rock to the top of a mountain where it would promptly roll back down again. That gravity is a nasty mistress, hey? Stories vary as to how Sisyphus angered the gods but eternity is a long time so it must have been bad. Poor bugger. And what’s more at the end of his labours there were no kimchi mushroom burgers. At least in my tale, there is kimchi mushroom burgers. Ok, so comparing myself to Sisyphus is possibly, maybe, in all likelihood overkill but I did have me a day. I woke bright eyed and bushy tailed planning to bake a wonderful banana bread from a recipe my friend gave me. I have tried it several times during playdates and I so wanted to share it with you. And I will. But not today. Today I made the gorgeous banana and coconut bread, set up the photo shoot and blah. Nothing worked. I hated it. All that work for…blah. So I stepped away, went to the garden to re-group, talk to the husband, get some air before returning to my Thunder-dome. Except when I arrived, one man had entered and already left. A female actually. A dog. A daffy Great Dane puppy with a penchant for eating anything that isn’t nailed down. And dang, wouldn’t you know it, I forgot to nail down the banana bread. But unlike Sisyphus’ tale, this story has a happy ending; kimchi mushroom burgers. I have been playing around with the flavours for a wee while and I intended a post soon. I didn’t know today was the day…but there you have it. 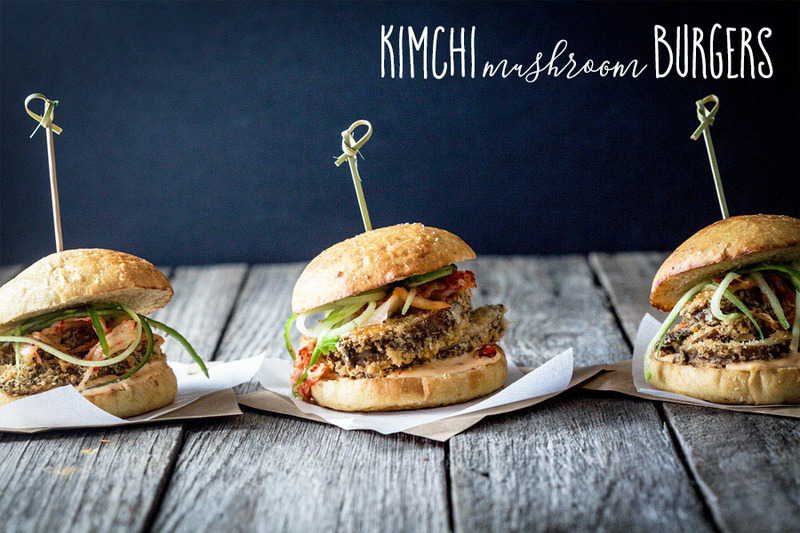 Kimchi mushroom burgers are my new favourite thing. 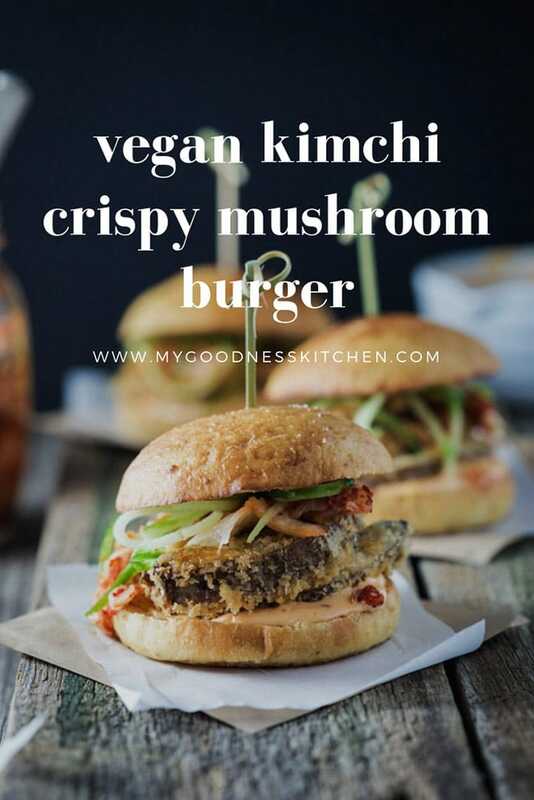 I researched and created a vegan brioche recipe, I found gorgeous kimchi recipes from The Minimalist Baker, Beyond Kimchi and The Simple Veganista but bought mine from our local organics store (don’t judge, I was on a mission and unprepared) and finally fried the mushrooms. In earlier attempts I had tried baking, half-baking and then grilling…but you know what, these mushrooms are best fried. Portobello or swiss mushrooms, rolled in Panko crumbs and shallow fried. It is what it is. And kimchi mushroom burgers are AMAZING. Sorry Sisyphus, you totally missed out. Sweet brioche burger buns, crunchy crumbed mushrooms, creamy kimchi mayonnaise, spicy kimchi and cooling cucumber.The happiest of endings. Enjoy. The lovely folk at Thrive Cuisine have put together an interesting piece on the power of the shroom. Check out The Science of Mushrooms for information on my favourite fungus. 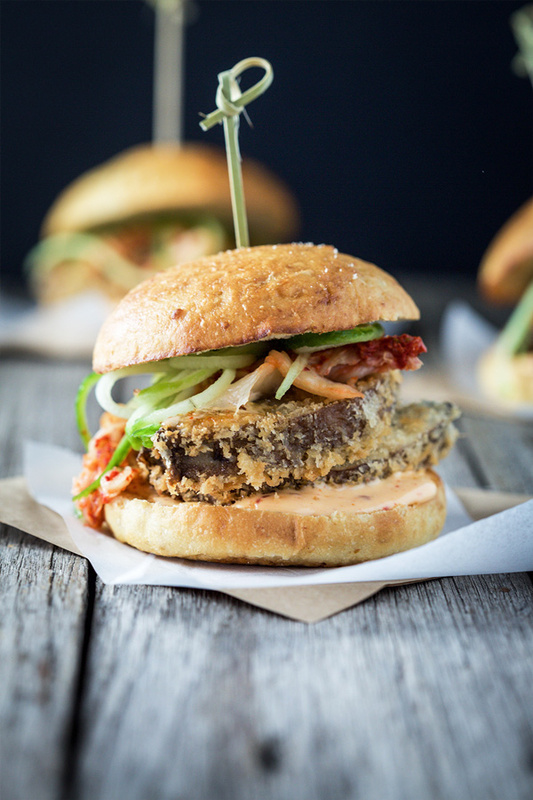 Mushrooms rolled in panko breadcrumbs with kimchi mayonnaise, spicy kimchi and cucumber served on a homemade vegan brioche bun, kimchi mushroom burgers. 2.5 tablespoons vegan butter softened. In a large bowl combine flour and salt. Add butter and rub into flour between your fingers, making crumbs. Stir in the yeast mixture and flax egg until a dough forms. Pour dough onto a clean, un-floured surface and knead until smooth and elastic, About 8 to 10 minutes. Shape dough into a ball and place it in a clean, lightly greased bowl. Cover bowl with plastic wrap and let the dough rise in a warm place until doubled in bulk. I left mine for about 1.5 hours. Divide dough into 8 equal parts. Gently roll each into a ball and arrange 2 to 3 inches apart on baking sheet. Cover loosely with a clean kitchen towel and let buns rise in a warm place for around 1 hour. Set a large shallow pan of water on oven floor. Preheat oven to 205 degrees C (400 F) with the rack in centre of the oven. Combine 1 teaspoon almond milk with 1 teaspoon agave and brush on to buns. Bake, turning sheet halfway through baking, until tops are golden brown about 15 minutes. Combine the mayonnaise and kimchi juice in a bowl and set aside. For the mushrooms, put the flour on a plate, the milk in a soup-size bowl and the Panko crumbs on another plate. 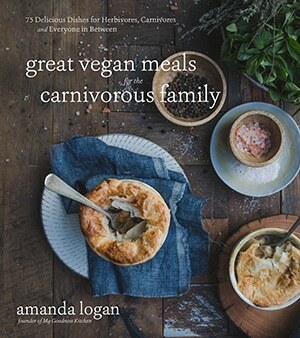 Sit them beside each other with a large plate at the end to put the finished crumbed mushrooms. Roll each slice of the mushroom in the flour, then the milk and finally roll in the crumbs. Heat enough oil to fill a fry pan 1/2 inch. Test heat by flicking some cold water in, if it sizzles, it's ready. Shallow fry the mushrooms for around 2 minutes on each side or until golden. Place on kitchen paper to drain. 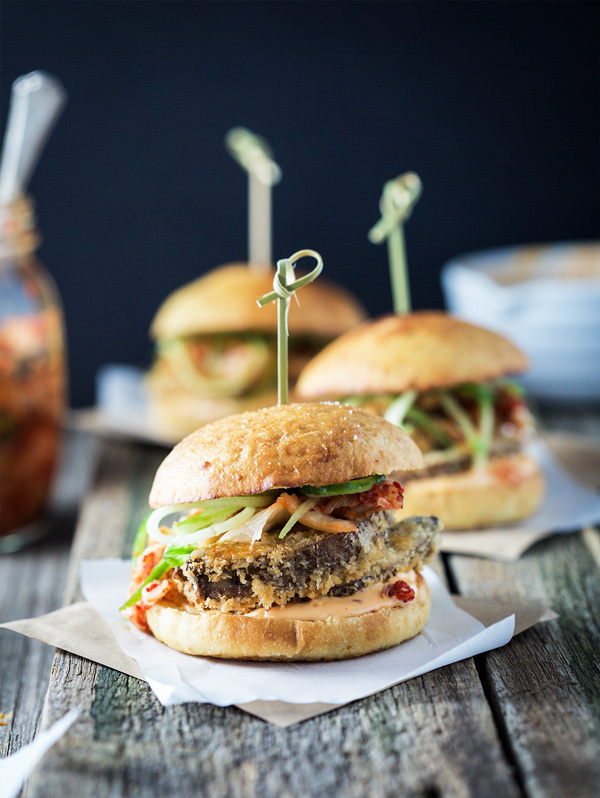 To assemble the burgers, slice the buns in half and add a good dollop of kimchi mayonnaise to the bottom half. Add the crumbed mushrooms, followed by as much kimchi as you like and a handful of sliced cucumber. Add the bun lid and serve. Hey Amanda, these burgers look awesome! I’m going to have to give it a go sometime soon. 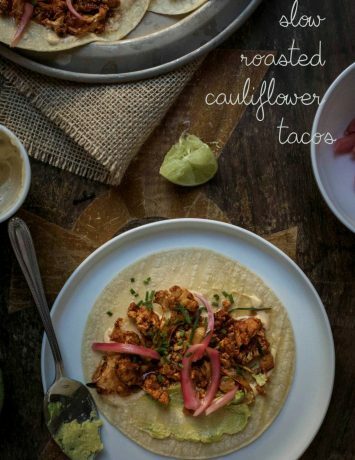 Bookmarking your page for a future meal. Thanks! Hahaha! Always happy to add a little nostalgia to the blog. I hope you enjoy the burgers. I am obsessed with them. Thanks Keith. I love, love, love mushrooms. I hope you try the burgers. Cheers for visiting. Stunning pictures. Seems it wasn’t such a bad day after all because these burgers are a triumph. Delicious! Thanks so much Lis. It wasn’t a bad day after all! Stunning pictures. Seems it wasn’t such a bad day after all because the burgers are a triumph! Delicious.